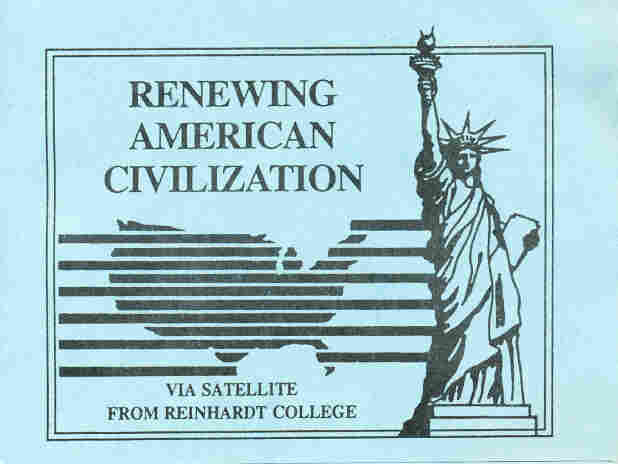 Gingrich And The Lessons (And Lecture Notes) Of History : It's All Politics Notes from Gingrich's 1994 college course "Renewing American Civilization" include his thoughts on American exceptionalism and how to turn distressed urban areas into places where people can "pursue happiness without fear." Newt Gingrich once called himself "the most seriously professorial politician since Woodrow Wilson." But that was 1995, and the "Contract with America" co-author had just helped to propel Republicans into power in the House for the first time in 40 years, and Gingrich himself into the speaker's role. Even the rarely modest Gingrich had reason to gloat. Just two years later, of course, he had become the first speaker ever punished by the House for ethics violations, and the end was in sight for both his leadership and congressional career. Gingrich's troubles stemmed in part from his professorial work, a 1994 college course he had taught in Georgia. NPR's Peter Overby this morning notes that Gingrich "admitted he had unintentionally but materially misled the [House ethics] committee and had failed to keep the college course insulated from partisan politics." Newt Gingrich used these lecture notes and similar pamphlets as part of the 1994 college course that became central to a later House ethics investigation. Overby, who covered Gingrich in the 1990s, saved several class lecture notes from Gingrich's Reinhardt College course on "Renewing American Civilization." "American Civilization cannot survive with 12-year-olds having babies, 15-year-olds shooting one another, 17-year-olds dying of AIDS and 18-year-olds graduating with diplomas they cannot read. "The Welfare State has failed. "Our generation must replace, not repair, the Welfare State." In a Feb. 12, 1994 session he called "Lessons of American History," Gingrich's lecture notes also include a lengthy explanation of "American Exceptionalism." We've scanned the entire lecture note, and you can see it here. Lecture notes from Feb. 26, 1994, "Saving the Inner City," include Gingrich-recommended steps to turn distressed urban areas into places "where Americans enjoy their constitutional rights and pursue happiness without fear." Gingrich's academic credentials have become the subject of renewed interest as his presidential campaign has surged. On Sunday, the The New York Times' Frank Bruni looked at the irony of the popularity of a self-described historian (who earned a Ph.D. from Tulane) in a Republican Party "supposedly hostile to intellectuals and intellectualism." And if Gingrich did become president? He'd be the first to hold a Ph.D. in the White House since ... Woodrow Wilson. (That trivia courtesy of Adam Hochschild in a New York Times op-ed).